This was another night of unexpected excitement on our first sea kayaking expedition along the north coast of Irian Jaya. Ten travelers and I had hired a local fishing boat crew for support and safety and embarked on a three-week-long journey along the pristine shores of this easternmost province of Indonesia. It was a crazily wild place where only a handful of travelers had ever journeyed before. We were rewarded with the most amazing marine and coastal wildlife habitats in the tropics and explored indigenous villages only rarely visited by missionaries and government officials. “You can’t do that—they are critically endangered!” I barked maybe too harshly back at him, spun around and with a couple of the other expedition members sprinted after the two-and-a-half turtle hunters as fast as we could. Our aim was to stop them before the potential carnage. Not far away, in the next bay over, we caught up with the hunters and immediately spotted her. The site that met us was truly amazing. A huge grey-black female leatherback turtle was laying a cluster of eggs into a large sand pit that she had just excavated with her large flippers. She had a primordial aura about her and looked almost like a small dinosaur, though at same the time, there was a touching human element in her facial expressions. Tears were trickling out of the corner of her reptilian eyes and she even panted loudly each time she released an ivory-colored egg into the slimy pile below. The sailors were anxiously waiting for the all delicious eggs to be dropped so that they could scoop them up and subsequently chop her up for supper meat and bait. We begged them to leave her alone and they reluctantly lowered their machetes and withdrew out of the circle of light from our headlamps. We were relieved that we saved this magnificent sea turtle and her offspring from being butchered. The leatherback turtle (Dermochelys coreacea) is a truly amazing creature. These gigantic species of pelagic turtles are great divers—one of the deepest diving marine animals. Individuals have been recorded diving to a depth of more than 4,000 feet and sometimes they can dive for longer than an hour. Beaked whales and Sperm whales are the only animals that dive deeper! Leatherback turtles are also the fastest moving reptiles in the ocean and have been recorded swimming at speeds faster than 20 miles per hour for a sustained period of time. That speed is achieved with the most hydrodynamic shape of any turtle, a large teardrop-shaped body. 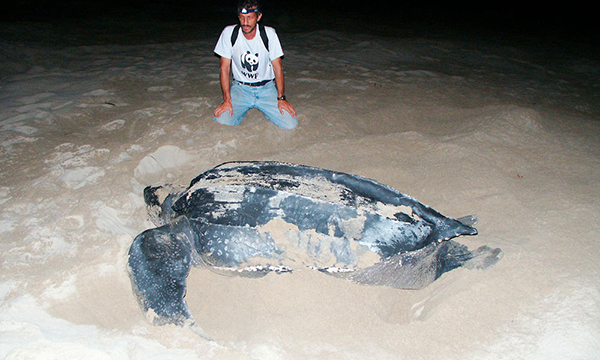 Even the size of a leatherback turtle is amazing. The largest ever found was on a Pakistani beach, a little more than seven feet long and weighing more than 1,400 pounds. Leatherback turtles’ upper life span exceeds 100 years—but the fact is that we don’t know for sure. There are a lot of things we don’t know about sea turtles—yet another reason for protecting them. 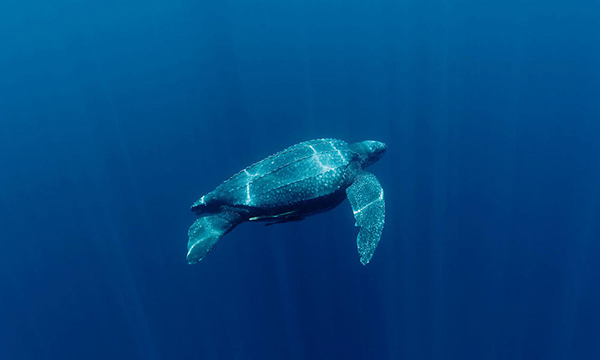 Giant leatherback turtles have a wide distribution in tropical and subtropical waters and the one we had found belonged to the western Pacific population, which nests on remote beaches in Papua New Guinea, eastern Indonesia and the Solomon Islands. After nesting, they swim more than 6,000 miles across the Pacific to the west coast of the U.S., foraging on jellyfish along the way. One radio-collared leatherback was tracked swimming more than 12,000 miles for 650 days without ever going ashore. Leatherback turtles are critically endangered and with their numbers declining at one of the fastest rates of any large animal in modern history, each individual animal is precious. The World Wildlife Fund estimates there are only 2,300 adult females left of this western Pacific population of leatherback turtles, so my forceful response to Chris and our efforts to prevent the hunters from killing the mother turtle in labor were totally justified. 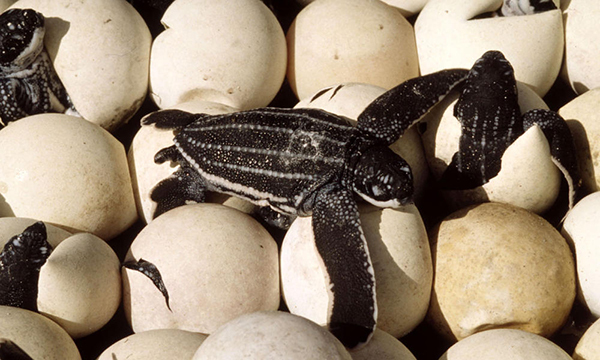 The reason for the rapid decline of leatherback turtles is a combination of turtle meat and egg poaching (eggs being considered a delicacy and an aphrodisiac for centuries), as well as being a large bycatch from pelagic trawling. Sadly enough, many leatherback turtles die from eating and being asphyxiated by the millions of plastic bags floating all over the oceans today, since the bags resemble jellyfish, their natural prey. Global warming is also taking its toll—with rising seas levels causing loss of the beaches that serve as the turtles’ nesting grounds. The survival odds are truly against these amazing creatures. Nonetheless, we had at least stopped our crew from killing the mother sea turtle on that dramatic night in Irian Jaya. We had to stay vigilant all night until she had finished laying all of her eggs, covered the sandpit and lumbered out towards the breaking surf. We watched in awe as she left her tank-wide tracks behind– the only evidence of her presence from the night before. At dawn, she swam out on her next long leg of pelagic travel. After the whole nocturnal ordeal, we ourselves were exhausted, but happy for a conservation mission accomplished—even if this was just a small effort on the larger species conservation scale. But if each of us as conservation travelers can contribute a little bit, then our meanderings are justified in an even more meaningful way. That is what Natural Habitat Adventures is all about–connecting our clients with the wonderful species and habitats around us and also giving something back. It could be as lessons to our travelers’ children or grandchildren, donations to great conservation organizations such as WWF, or, if you are lucky like us—spending a night protecting a vulnerable kura-kura in Indonesia. Want to take action now to help save endangered sea turtles? You can participate in hands-on turtle conversation efforts on a wildlife adventure in Mexico or swim alongside sea turtles on a Belize nature safari.